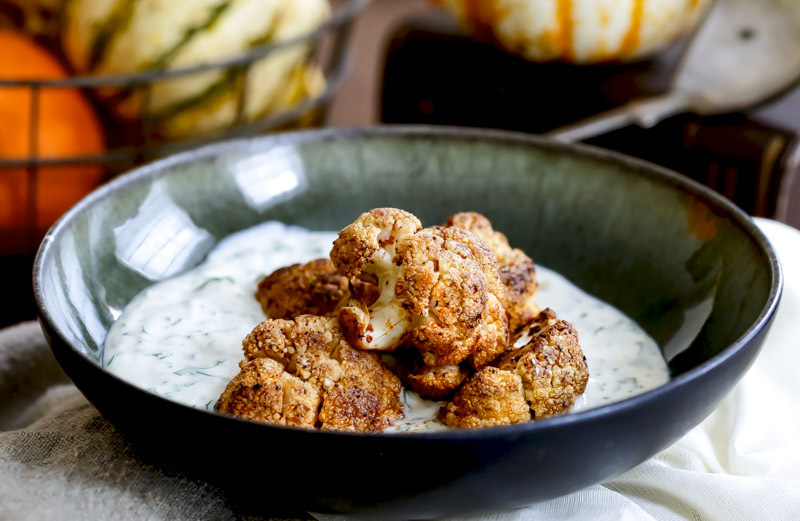 "Move over broccoli" here comes cauliflower. For a number of years now, food articles about this brassica point to the revival of a vegetable often boiled and over-cooked, and discarded as being ordinary, smelly, and uninteresting. The common cauliflower is white but it can also be orange, green or purple. Each boast different health benefits and all are good to our digestive system and wellbeing. They are low in fat, high in fibres, and possess many vitamins. Raw, you can crunch them as a filling snack; you can also cook them in many delectable ways. At home in Lebanon, we deep-fried the florets. No batter, just as they were. They came out soft on the inside with crispy bits on the outside. We dipped them hot in a tangy, garlicky tarator sauce. I have to admit I like this simple variation. However, I try avoiding frying food; on the one hand I do not like the lingering smell in my home, and on the other, it is not so healthy. In Boston where I am currently living, autumn has set in. The air is crisp and foliage is bright with rusty, golden colours. This makes me want to change my eating habits. I only wish I had a fireplace to roast chestnuts. Warm and coloured spices, which I tend to leave on the shelf in summer, are sneaking back into my food. I swathed my florets with a mixture of aromatic and fiery seasonings and roasted them in the oven with a drizzle of olive oil. They came out soft and yet they retained enough crunch to help forget that they were once thought of as soggy and limp. I ate them with a yogurt, garlic and herb based sauce. Wash and trim the cauliflower and pat dry on kitchen paper. Separate the florets and place them in a deep bowl. 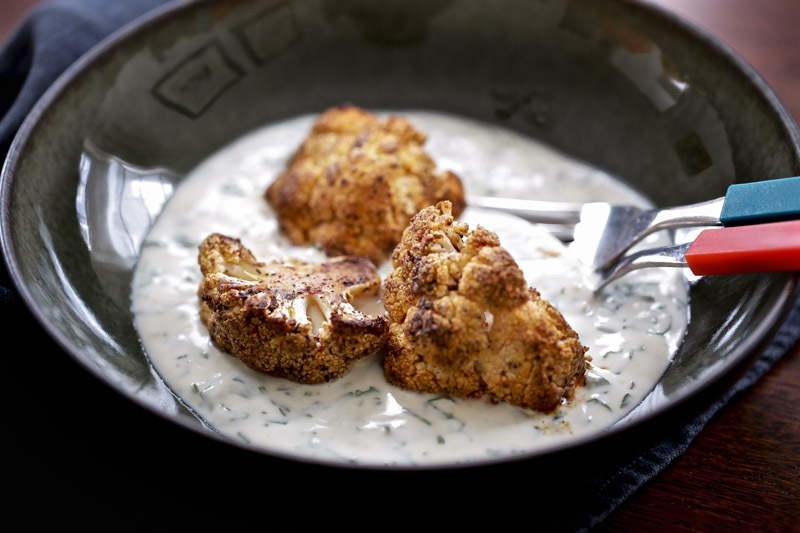 Mix all the spices together in a small bowl and sprinkle them over the cauliflower. Toss the florets into the spice powder until evenly coated. Transfer them to an oven dish and drizzle about 2 tablespoons of olive oil over them. While the vegetables are cooking prepare the yogurt sauce. Using a whisk, mix together tahini and yogurt until smooth and well blended. Mix in the crushed garlic together with 1 teaspoon salt. Finally, combine the sauce with the chopped parsley. Spoon the yogurt in the bottom of a dish and arrange the florets in the middle.